Hailed by the Australian Daily Telegraph as a “viola prodigy,” Lisa Sung is a special prizewinner of the 2016 Lionel Tertis International Viola Competition and 2017 Cecil Aronowitz International Viola Competition, silver prize winner of the 2017 Manhattan and 2017 Vivo International Music Competitions, and two-time winner of the Australian States Concerto Competition. An avid soloist and chamber musician, Ms. Sung has frequently performed solo at the Sydney Opera House and in chamber music recitals at Alice Tully Hall in New York, as well as in Europe and Asia. She has performed for Australia’s Prime Minister John Howard, live on Sydney radio broadcasts, and is currently a substitute violist with the Saint Paul Chamber Orchestra. Ms. Sung has been a participant of leading music festivals such as the Music@Menlo International Program, Perlman Music Program, Taos Chamber Music Festival, Lac Léman Music Masterclasses, and IMS Prussia Cove. Ms. 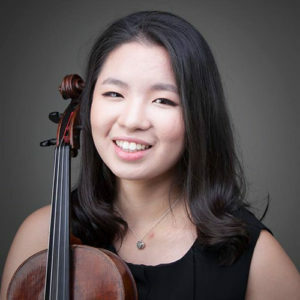 Sung has recently graduated from the Juilliard School where she was a proud recipient of the Kovner Fellowship scholarship under the tutelage of Paul Neubauer. At Juilliard, she served as Principal Viola of the orchestra, and was a member of the Honors Quartet.